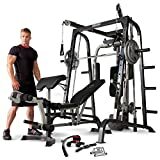 The Marcy MD-9010G Home Gym Smith Machine is the ultimate overall gym system, it provides an almost limitless exercise range without sacrificing it’s high quality construction. Commercial quality linear ball bearings have been installed in the smith press bar, these offer a far superior smooth gliding action as oppose to most home smith machines that use plastic bushings. Other stand out features include an independent weight bench with quick pin angle adjustment for military, inclines, flat and decline variations. Dual high swivel pulleys and a low pulley system with foot plate, heavy gauge steel frame work ensures the MD-9010G is solid and durable.